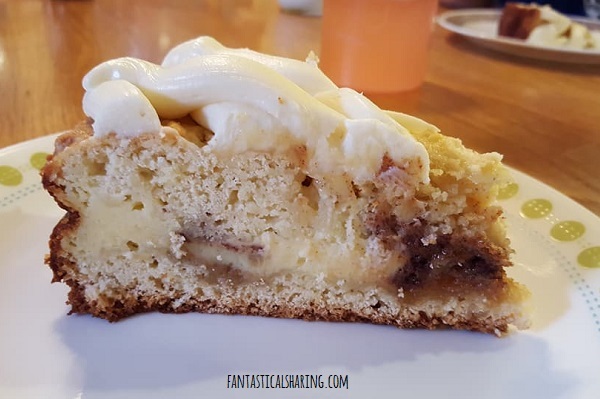 Layers of cinnamon roll and cheesecake topped with a luscious cream cheese frosting, I won't judge you if it's dessert for breakfast! Each year, I love to choose my birthday cake out and make it for myself. I know that's weird to someone, but I find it fun because I get what I want and also I love to bake, so it's not a chore to me. 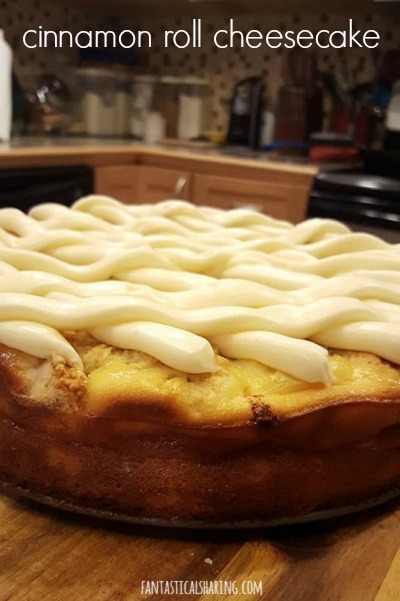 For my 29th birthday in 2017, I decided upon a cinnamon roll cheesecake for my birthday cake. During my pregnancy with Matthew, I became obsessed with Cinnabon. There are a great number of times where I have an insatiable craving for cinnamon rolls (homemade, large and in charge cinnamon rolls) but I don't really want to make the effort to actually make them. No matter how much I love them. For the cinnamon roll crust: Beat together butter and sugar for 3 minutes until light and fluffy. Add egg, milk, and vanilla and beat for 1 more minute. Scrape the sides of the bowl. Add flour, baking powder, and salt. Mix on low until combined. Spread half of the mixture onto the bottom of a parchment paper-lined and greased 9-inch springform pan. It will be sticky and you may want to grease your hands to be able to pat it down. Transfer other half of crust batter to a small bowl; set aside. For the cheesecake: Beat together cream cheese and sugar for 2 minutes on medium-high speed. Add eggs, one at a time. Scrape down the sides of the bowl after each addition. Add vanilla and flour; mix for 1 more minute. Pour cheesecake batter on top of the cinnamon roll crust batter. For the cinnamon filling: In a small bowl, mix together butter, cinnamon, and brown sugar. Place dollops of the filling on top of the cheesecake layer, taking care to not get too close to the edges of the pan. Take the remaining crust batter and place dollops over the top of the cinnamon and cheesecake. Use a knife to gently swirl the batter. Bake in a preheated 350 degree oven for 45 to 55 minutes or until the center is set. Remove from oven and let cool for 20 minutes at room temperature. Then cover and chill in refrigerator for 4 hours. For the cream cheese frosting: Beat together cream cheese, butter, powdered sugar, vanilla, and salt until light and fluffy. Add milk if needed to make thinner, a little at a time. Pipe, drizzle, or spread the frosting onto the cheesecake. I love this German cheesecake called Kasekuchen. It's light and perfect topped with any fruit! I'm also really wanting to try this version of Cinnamon Roll Cheesecake from Confessions of a Baking Queen because it utilizes cinnamon roll Oreos for the crust. YUM!